Your pets need to be active to keep their minds busy and bodies strong. Different kinds of pets will need different kinds of exercise. Even different breeds will require different types of exercise and levels of activity. Dogs of all sizes and ages need to exercise! If your dog is unruly, barking nonstop, digging, misbehaving or acting destructively, then you may not be exercising him enough. Try challenging your dog with training sessions and take plenty of walks. Consider taking your dog to the nearest dog park if your dog gets along with others well. Some dog breeds have been bred to herd while others are hunters, workers or swimmers. 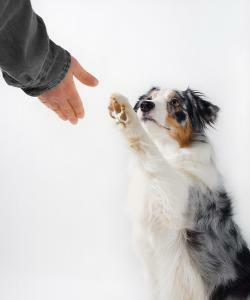 Knowing your dog and what drives him will help you find the activities that are right for him. Though puppies often need large amounts of high-energy activity, geriatric dogs will also need exercise to help them continue to stay active and happy (although, exercise for older pets should typically be much calmer and low-impact). Unlike dogs, most cats can’t simply be attached to a leash and led for a walk. Yet, your cat may need more exercise than the limited space in your home provides. You should spend 10-15 minutes a few times a day to play with your cat and engage her in activity. This is even more important if your cat is older or overweight, although it may be slightly harder to get your cat’s attention and your activities may be shorter in duration. Use a small flashlight or laser pointer to flash the light across the floor as your cat chases it like a bug. Did you know you can exercise your bird? Birds fly hundreds of miles a day in the wild, but their ability to exercise freely is limited in captivity. Your bird will be more happy and healthy if you keep him active. Purchase some challenging toys, like ropes for climbing or “foot toys” to toss around. Play games with your bird and teach him tricks. You can try fetch or pull around a toy on a string for a game of chase. You can teach your bird to wave, step-up and much more, which will challenge your bird and allow you both to bond. Play music and dance! Notice what music your bird seems to like and respond to the most. Practice out-of-cage play so your bird is able to walk and spread his wings in a larger space while supervised. If you need help assessing your pet’s exercise needs or want ideas about appropriate activities to keep your pet moving, call us today! We can look at your pet’s weight, talk about nutrition and help you consider activity level by breed and animal type. We want to help you give your pets the happy and healthy lives they deserve.